Facilitated by AIPR’s Africa Programs, the Kenyan National Committee for the Prevention and Punishment of the Crime of Genocide, War Crimes, Crimes Against Humanity and All Forms of Discrimination (KNC) held a Strategic Planning Meeting on February 22-24, 2017 in Naivasha, Kenya. KNC members, including representatives of the security sector, political sector, Uwiano Platform for Peace, and civil society attended the Strategic Planning Meeting. During this three-day consultative and planning meeting, stakeholders strategized about ways to implement and operationalize the skills developed during the five-day KNC Training Seminar on Early Warning and Early Response held in December 2016. 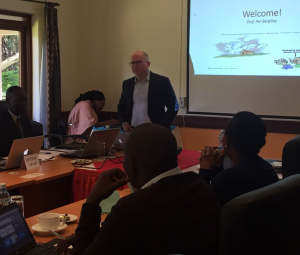 KNC members developed strategies for operationalizing the relevant early warning and early response institutions represented in the KNC, with a particular focus on the upcoming Kenya National Elections in August. Elections are processes, not events. Elections do not cause violence but they increase tensions among already sensitive areas in society. Violence in this setting is not just an act of force but takes on other forms such as threats, vandalism, bribery, intimidation, or psychological abuse. Violence in this context has an instrumental end often aimed to obtain or maintain power by the political elite. 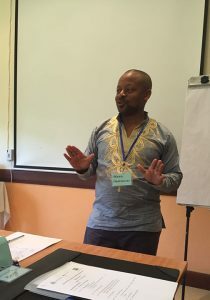 In addition to a discussion of best practices and lessons learned, participants examined the use of elections as an organizing principle for those working towards violence prevention. To this end, the pre-election phase (assessment of risks and interventions strategies), the election phase (monitoring of free and safe voting), and the post-election phase (adjudication, audit, and evaluation) all key considerations for prevention. With the national elections only five months away, KNC members were advised to identify prominent community leaders and use them as vehicles to spread messages of peace and denounce hate speech as the election approaches. KNC members also saw the upcoming election as an opportunity to team up with ICGLR election observers and to coordinate with ICGLR and EAC on prevention-based messaging leading up to the election. The participants discussed the potential for a separate police training program, which would likely occur after the elections. This conversation included key stakeholders within the Kenya Police Service, including the Head of Training. 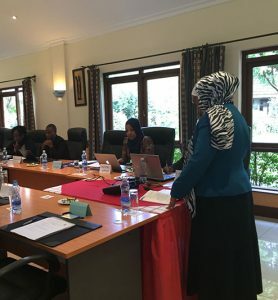 Additional matters covered at the Strategic Planning Meeting included the upcoming KNC Rwanda Retreat, which will be a learning and planning exercise for a “Never Again” memorial in Kenya and a conversation about the themes that will be addressed in the KNC Thematic Training Seminar. After discussion with the KNC, it was agreed that this training seminar will be moved up from July 2017 to May 2017 as the previous date was determined to be too close to the August elections.